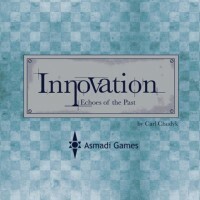 Echoes of the Past is an expansion for Carl Chudyk's Innovation, released in 2010, that mirrors the construction of the earlier game as both include 110 cards, 105 cards that are divided into different decks (labeled age 1 to age 10) and five cards that show special achievements that can be claimed. The expansion's 110 cards are all new. Echoes of the Past changes game play in a number of ways. First, the number of cards in each age deck is determined by the number of players, instead of being constant. Second, to create the age decks, players shuffle together the cards from the base game and expansion for each age, then deal out the proper number of cards. Third, the maximum player count is increased to five. Fourth, and most interestingly, echoes of the past introduces new game mechanisms. With Foreshadow, a player can stash a card under his player board, then bring it into play (and use it) on a later turn when he melds a card that's from the same age or a higher one. With Echo, when a player takes the dogma action of a card in play, he can receive additional actions showing on that card and any other cards visible in the same stack. Innovation: Echoes of the Past is an expansion for the base game of Innovation. It adds 110 new cards with three new mechanics bringing variety to the base cards. Echoes of the Past adds more to the base game of Innovation. More cards, more mechanics, and more tricks to pull on your opponents. This review will assume that you are familiar with the way the base game plays, and only cover what the expansion adds or changes from the base game. First of all, setup now takes a little longer. Each Age deck now need to be set up with a set number of cards from each set depending on the number of players. This means that if you are familiar with all the cards in the base game, some of them will now be left out each game, shaking things up a bit. There are also now enough cards to play a 5-player game, though this will only add to the chaos if that bothered you about the base game. Three new mechanics are introduced in the expansion: Foreshadowing, Echoes, and Bonuses. Various dogma effects allow you to “foreshadow” cards, usually from higher decks, by drawing them and placing them in your forecast. On later turns, when you meld a card from an age equal to or higher than a card in your forecast, you may meld one of those cards and take its dogma action for free. The second new mechanic, Echoes, represents different ideas/inventions having an effect on future ages. Some of the cards in this expansion have dogma abilities in place of an icon on the card. These effects are activated whenever you play the dogma action in that stack as long as you can see them in the splayed stack. The final new mechanic is the Bonus points, that appear on some cards in place of icons. These icons are worth points equal to the highest bonus on your board, plus one for each additional bonus. This means that if you have visible bonuses of 7, 4, 3, 2, then you would have an additional 7+1+1+1=10 points. This expansion takes everything that I love about Innovation and gives me more. More variety, more action, more options. The only minor complaint is that setup now takes a little longer. Other than that minor quibble, this is a perfect expansion, breathing life into the base game without increasing the difficulty substantially. Unless teaching new players, I will never play the base game without this excellent expansion. Add a Review for "Innovation: Echoes of the Past"